It was a fine day when three pilots left R.A.F. Benson in Oxfordshire on the 4th of July 1939 in their Fairey Battle Mark 1 aircraft (serial number – K9391). They were on what was deemed at the time to be a straightforward training mission flying from Benson to Roborough airfield on the outskirts of Plymouth where they were to refuel. The crew consisted of the pilot – Sergeant Pinsher (or Pincher or Pinchard, depending on what source), the air gunner and observer – Sergeant John Colton and the wireless operator and navigator – Sergeant James Dolan. As they neared Roborough airfield the infamous Dartmoor mist rolled in and enshrouded them in a thick miasma which left them clueless as to their location. The crew calculated that by their current flying time they should be somewhere near Plymouth so the pilot lowered the undercarriage and began to slowly descend through the mist. Just as the visibility cleared they noticed with horror that the plane was rapidly heading straight for the rocky hillside. As it tr4avelled up the hillside the aircraft briefly became airborne again when it reached the crest of the hill before heading to ground zero on the other side. As the aircraft hit the ground its undercarriage fractured and the plane broke into two pieces with wreckage being scattered near and far. Realising that fuel had been liberally spayed all over the aircraft the crew quickly managed to scrambled to safety for fear it would become engulfed in flames which luckily it never did. Once at a safe distance the men checked their injuries, Pinsher came out relatively unscathed thanks to his seat harness, Dolan sustained cuts to his scalp and various other minor injuries and Colton ended up with a dislocated shoulder along with various cuts and bruises. – Lewis, p.17. Having survived one ordeal the crew were now faced with another, it soon became clear that they were on the edge of Dartmoor’s ‘badlands’ with no idea how to reach safety. To make matters worse the fog still engulfed the moor with what was reported to be restricting visibility down to around 45 metres. If you look at any map showing Lower White Tor you will see that in all reality there was only one safe route and get it wrong and the men could well be wandering around for ages. If they had gone north then the party would have been delivered onto the high moor along with its bogs and mires. Should they have chosen to have gone in a westerly then again it would have been an arduous trek across open moorland. As any smoker knows, many a momentous decision has been made over a contemplative cigarette and so it was in this case, after a brief ‘smoke break’ the men headed off in an easterly direction. As luck would have it this brought them into Hollowcombe Bottom where they were greeted by the infant Cherrybrook merrily gurgling its way southwards. Following the age old advice that every watercourse would eventually lead to human habitation the airmen decided to follow it. Once the crew had been safely attended to and the crash site found a salvage team was sent out to removed the various instruments and guns. The rest of the wreckage was left in-situ and was reported to be still there in 1945. What became of it nobody is sure but somewhere along the line it was reportedly buried until in the 1970’s a team from the Devon Aircraft Research and Recovery Team carried out an excavation to recover what remnants were left. Lewis, p.18. 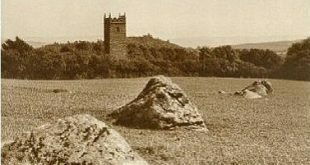 One unconfirmed report suggested that the remains which were recovered once were housed at a house in Torquay and was/is awaiting eventual display – the DARRT are no longer active? 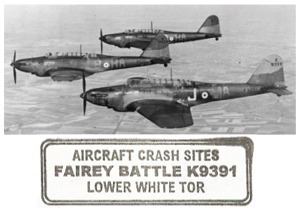 As can be seen above, the crash and its site was once commemorated by the siting of letterbox stamp which was part of a series of such crash sites. There have been numerous aircraft crashed on and around Dartmoor but mercifully this one had a happy ended with all the crew escaping safely and with just some minor injuries. Lewis, G. 2016. Wings Over Dartmoor. Davidstow: Leesthorpe Publishing.